The very first part is missing from the tape. Announcer: That's the technology that can beam radio frequencies to destroy missile and aircraft components, scramble radar screens, and even alter human mind functions. It all sounds like another chapter in Star Wars controversy ... then military affairs specialist Chuck DeCaro hopefully can bring this issue into focus with this report. DeCaro: Imagine the implications of a weapon with no visible trace -- a weapon that could knock out tanks, ships, and planes as fast as the speed of light. The same technology, with modifications, could disorient and even tranquilize military personnel, rendering them virtually helpless in the battle zone. These are the new weapons of war we will examine in this series. For the past 40 years, the world has been riveted by the threat of nuclear war, and more recently by the prospect of space defenses using lasers and other modern technologies. But while both sides of the Geneva Summit will be focusing on these matters, progress is being made in even newer weapons that could render any arms agreement relatively useless. Lightning is the most dramatic form of energy to be found in nature. Scientists have succeeded in creating limited types of artificial lightning. 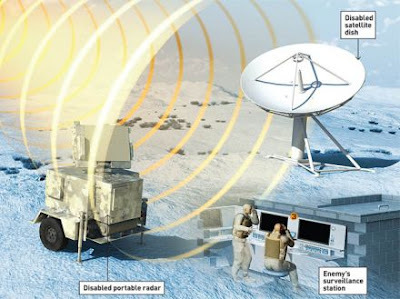 And some think that these could be the forerunners of a new type of directed-energy weapon, part of a family of weapons that operate within the radio frequency segment of the electromagnetic spectrum, and are thus referred to as radio frequency weapons. Dr. James Fraser has researched electromagnetic effects for the Air Force for over ten years and he, like a growing number of weapons experts, feels that radio frequency, or RF, weapons could be the wildcard in the ongoing arms race. Fraser: You could have tremendous amounts of radiated power, and what you did with that power, then, is a matter of engineering design, and what your goal is. DeCaro: Robert Bass, a physicist and Ph.D. in mathematics, is working on U.S. weapons research. He says that the Soviets seem to be ahead in a number of areas, and especially in RF weapons. Bass: We are behind the Soviet Union in directed energy weapons based on 60 gigahertz microwave beams. DeCaro: Dr. Bass and others feel a most likely form of Soviet RF weaponry would be high-powered microwaves, similar to a focussed, ultra-high-intensity radar beam. It would literally cook humans, and knock out computers and electronic surveillance and communications gear. An operational RF weapon, relatively cheap and reusable, could devastate sophisticated and expensive war machinery. The 20 million dollar F-16 fighter, for example, is totally controlled through electronic sensors and computers. With no manual flight controls, the plane would literally fall out of the sky after being hit with a high-intensity pulse of microwave radiation. Scientists say that microwaves and other types of RF pulses, operating at specific frequencies or windows, can be transmitted with little or no loss of power. Machines known as gyrotrons can produce the massive pulses needed to drive these devices, and it's believed that the Soviet Union has a three-to-five-year lead in this technology. Over the past year CNN has repeatedly asked the Department of Defense and the Air Force about radio frequency weapons. After much resistance, DOD finally said that the subject was too sensitive to discuss. This is a Tesla coil. It was invented some 90 years ago, but now a growing number of experts in the United States feel that it may form the basis of a new generation of Soviet weapons. They are known as radio frequency, or RF, weapons because they operate in the radio frequency spectrum. Their existence is noted in this Department of Defense publication, which says the Soviets could use them to destroy components of missiles, to interfere with radar and other electronic systems, and even to alter human mind functions. The concept of RF weaponry was predicted at the turn of the century by Nicola Tesla, an American who had emigrated from Yugoslavia. He is best remembered as the man who invented alternating-current electricity. In 1899, Tesla built this giant coil which produced 10 million volts of artificial lightning. From it he theorized the possibility of death rays. This, and many of his other ideas about the physics of electricity, were ridiculed by the scientific establishment. Golka: Pure science is not a sure thing -- you can't predict what's going to work out and what's not going to work out. DeCaro: Robert Golka, a research scientist, built a replica of the Tesla coil about 80 years later. Golka was trying to produce a phenomenon known as "ball lightning." He also used the Tesla coil to conduct testing for the U.S. Air Force. DeCaro: These experiments could also demonstrate the effect of the electromagnetic pulse of a nuclear blast and, Golka says, the effect of RF weapons as well. Golka thinks that Tesla's theory that electromagnetic power could be transmitted through the Earth and its atmosphere without wires is a key element in the Soviet Union's work on RF weapons. Tesla's novel weapons theories were generally ignored in the United States. Nikola Tesla died in 1943, and after the Second World War all his papers and effects were shipped to his native Yugoslavia where they were enshrined in a museum. Some say that that museum proved to be a goldmine for Soviet weapons scientists. Bearden: We haven't even formally, so far as I know, to ourselves, admitted that these weapons exist in the hands of the Soviet Union. DeCaro: Weapons analyst Tom Bearden, a retired U.S. Army lieutenant-colonel, is among a small group of scientists and engineers who believe that the Soviets have perfected Tesla's ideas and are developing radio frequency weapons on a scale unimagined in this country. Bearden: There have been a series of tests of these kinds of weapons, apparently, for a number of years. For example, airliners from Iran, before the fall of the Shah, saw deep within the Soviet Union very large, glowing spherical balls of light which started out small and then expanded to very large size, which are apparently these kinds of weapons for use in an anti-ballistic missile defense role. DeCaro: Bearden believes that these satellite photographs are of mysterious non-nuclear explosions near an uninhabited island in the East Siberian Sea, and that they are discharges from an RF weapon that uses intersecting energy beams called "scalars." Bearden: In doing so you can create, for example, either an electromagnetic explosion at a distance, or you can create an electromagnetic implosion at a distance -- the extraction of energy from a distant point. This would look like a cold explosion, so to speak, and I believe the thing on April the 9th, 1984, off the coast of Japan that involved several 747 jet airliners -- I believe that incident was a test of a cold-explosion weapon -- at least, it met all the characteristics. DeCaro: Pilot Doug Happ was in one of the five airline crews that saw an incredibly large cloud rising from the moonlit overcast below. Happ: It looked like a plate coming up through an overcast, bit it just kept expanding, and as it got higher it was apparent that you could see right through the middle of it, so it looked like a big smoke ring. At the time that we first noticed this cloud we weren't sure what to do and we took no evasive action because we didn't know which way to go, and I think eventually we either rammed through it or it completely engulfed us. DeCaro: Happ says when his flight reached Anchorage, Alaska it was checked for radioactive contamination. None was found. Dr. James Fraser has done extensive research in electromagnetic effects for the U.S. Air Force. Fraser: It could be due to a strong electromagnetic beam, but we don't know that. They can also be caused by chance terminal gradients; we've had for several years studies of clear air turbulence, for instance, which have produced this kind of disruption. The people who sighted those are experienced pilots and should have been familiar with that kind of event, and this apparently was something outside their experience. DeCaro: There have been a number of times when Soviet technological surprise has upset the strategic balance. In 1948 the Soviets detonated an A-bomb years before it was thought possible. In 1957 the Soviets stunned the world by launching Sputnik One, the world's first artificial satellite. And in 1976 the Soviets were discovered to have been embarked upon a program to build particle beam weapons, a discovery which led, five years later, to America's Star Wars program. In each case the United States was able to regain the balance. But this time, with radio frequency weapons, some scientists feel that the Soviet lead may be permanent. Next, how RF devices could be used against the human brain. DeCaro: Brainstorm was a science-fiction movie about a device which electronically injected thoughts into the human mind. 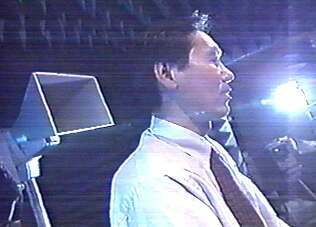 In this scene, the mind-control machine projects images into the brain of the chief scientist through an electrode headset. The scientist then finds himself experiencing the thoughts of a wild truck ride. But even in this futuristic Hollywood tale, the subject still had to be connected to the machine by an electrode headset. DeCaro: But not as remarkable as a real-life experiment where I was the subject of a prototype device designed to project images into the mind without electrodes. The prototype machine, developed from Soviet scientific data, could, according to some scientists, have a profound effect as a weapon of war. Electronic mind-control research is not new. A scientific milestone in this area came in the 1960s when Dr. Jose Delgado demonstrated remote control over a charging bull. By connecting a radio antenna to electrodes inserted into the bull's brain, Delgado proved that the animal's aggressive impulses could be thwarted by electronically manipulating the bull's muscle reflexes. Delgado: Do you realize the fantastic possibilities if from the outside we could modify the inside; could we give messages to the inside? But the beauty is that now we are not using electrodes. DeCaro: In recent years Delgado has shown that the behavior of monkeys can be altered using low-power pulsing magnetic fields. But in these experiments, there were no antenna implants. Delgado: Any function in the brain -- emotions, intellect, personality -- could we perhaps modify by this non-invasive technology. DeCaro: Delgado's research has so far been limited to animals. But in the Soviet Union a radio frequency, or RF, device has been used for over 30 years to manipulate the moods of mental patients. It's called a Lida machine. It radiates pulses of radio frequency energy as well as light, sound, and heat. The pulse rate is in the extremely low-frequency range between 0 and 100 pulses per second. Dr. Ross Adey is the top researcher at the Veterans Administration Hospital in Loma Linda, California. He has been investigating the effects of the Lida machine. Unidentified: Now what do the Soviets use this machine for? Adey: Well, they don't use it any more. We should be very clear that this is a machine that is regarded by them as somewhat obsolete technologically. DeCaro: This scientist, who did not want his identity revealed, is employed by the U.S. Government and has done secret RF weapons research. He believes that tests done with the Lida and similar machines prove that humans are susceptible to remote alterations of mood and awareness. Actor as Scientist: Certain kinds of weak electromagnetic signals work exactly like drugs, and so the promise is that anything you can do with drugs you could do with the right electromagnetic signal. Apparently, there are specific sites involved, specific functions involved. It's a matter of matching up, just like it is with a pill or a drug, to cause an effect. You could have a cause and effect relationship between a magnetic field and a biological function. DeCaro: CNN enlisted the help of noted physicist Dr. Elizabeth Rausher and electrical engineer Bill VanBise to build and test an RF mind-interference machine from data found in Soviet scientific literature. The machine itself was inexpensive and easy to construct using parts from a consumer electronics store. It emits a weak magnetic field pulsed at extremely low frequency. As the subject of the test I was blindfolded and my ears were blocked to prevent inadvertent clues as to what was happening. A magnetic probe was placed about 18 inches from my head. As the experiment began, two signal generators produced waveform patterns that were transmitted by the magnetic probe at about one one-thousandth of the Earth's magnetic field strength. VanBise:(watching a chart recorder) Describe anything that you see, if any. Rausher: A parabola just went by. VanBise: Oh, yeah, I did. I just flipped the switch. Parabola? VanBise: (makes note on the chart) Alright. Well, let's see. Check this out. That's what happened, I flipped the switch. DeCaro: OK. A spike right there! VanBise: I dramatically changed the generator; I stepped it by ten right here, and the intermix from the two generators was right where you said that you saw a spike. DeCaro: VanBise said that when I failed to see any change it was he had not set the proper frequency and power levels. Later, I asked VanBise what a weapon using this technology could do. DeCaro: How easy would it be to assemble a weapon from existing off-the-shelf parts? VanBise: Three weeks, I could put together a weapon that would take care of a whole town. DeCaro: We showed the results of our test to Dr. Robert Becker, a two-time Nobel nominee for his work in the biological effects of electromagnetism. Becker: This is a very significant experiment because it carries our understanding of how vision is actually performed a step further into the mystery. DeCaro: He said he thought the machine caused a disturbance in the brain's interpretation of vision and as such could be used as a weapon. Becker: That kind of a disturbance in the visual system could markedly influence the operations of a fighter pilot, a helicopter pilot, or even as simple an aberration in the visual field as making everyone seeing double or everyone having their visual field jitter like a poorly-adjusted television screen. The effect of that upon the efficiency with which an army and air force or a navy would operate would be catastrophic. DeCaro: When we come back, more about RF weapons. DeCaro: This is a Soviet Lida machine. It transmits low-energy radio pulses between 0 and 100 cycles per second. In the Soviet Union Lidas have been used for years to tranquilize psychiatric patients without physical contact. This sound, which is received by short-wave radios in the United States, is generated by another Soviet radio frequency device. It is known as the Woodpecker because of its tapping noise. It is broadcast by a number of high-powered radio transmitters operating deep in the Soviet Union since July 4th, 1976. Though the official Defense Department explanation of the Woodpecker is that it is an over-the-horizon radar designed to track U.S. missile launches, some scientists suspect that the Woodpecker is designed to interfere with human brain function. DeCaro:Dr. Robert Becker is a pioneer in the field of bioeffects of electromagnetism. Dr. Becker: The signal range within which the Woodpecker operates is that which has been reported by many investigators to produce a tranquilizing effect on animals. Dr. Beck: We are just incredibly sensitive to these magnetic stimuli. DeCaro: Dr. Bob Beck, a Ph.D. in nuclear engineering, has done extensive research into electromagnetic effects on humans. DeCaro: Dr. Larissa Valanskaya was heavily involved in electromagnetic research before being allowed to emigrate to the United States. She told CNN about Soviet Research in electro magnetic effects. Dr. Valanskaya: They demonstrated experimentally and also demonstrated experimentally that low-frequency, low-energy electromagnetic fields also can posses biological information -- biological efficiency because any field not only carries energy but also carries information. DeCaro: She stated that the research was carried out on orders from the Soviet Government. DeCaro: Is the United States military working in the field of electronic mind-control? Officially, the Department of Defense will not comment because the subject area is, quote: "Too sensitive." But CNN has learned from this government scientist, who did not want to be identified, that a Navy laboratory conducted research into the use of an RF device for counter-terrorism and special operations. Actor as the scientist: It's possible to entrain a certain percentage of a population, apparently, with weak magnetic fields. DeCaro: The study also showed that RF signals could dissolve certain types of rat brain cells at a distance, causing disorientation and nausea. According to the scientist, even though the program was successful, the government never followed up on it. Dr. James Fraser did electromagnetic research for the U.S. Air Force for many years. At one time he proposed a battlefield RF weapons system. Dr. Fraser: You could make an antenna that would be carryable by a helicopter and that this could be expected to produce a wide variety of symptoms, actually, by humans who happened to be standing in the beam. DeCaro: According to Dr. Fraser, the Air Force never followed up. At Lawrence Livermore Laboratory another RF weapons concept is nicknamed "The Brain Bomb." According to the book Star Warriors the Brain Bomb would focus a nuclear blast into a huge pulse of low-frequency RF energy that would stun huge numbers of troops. Apparently it, too, has not yet been funded. The Department of Defense will not comment about Soviet RF weapons, or if American RF weapons development is going forward. However, experts interviewed by CNN say that the Soviets are apparently ahead and could exploit that lead in a surprise strategic move -- a move that could have grave consequences for the United States. From Washington this is Chuck DeCaro, CNN Special Assignments.